History has been made. Bradley Wiggins (Sky) won the 2012 Tour de France overall in Paris on Sunday, becoming the first British rider to take the victory in the most prestigious event in the cycling calendar. And team-mate Mark Cavendish took an unprecedented fourth consecutive win on the Champs Élysées to top off a remarkable Tour. 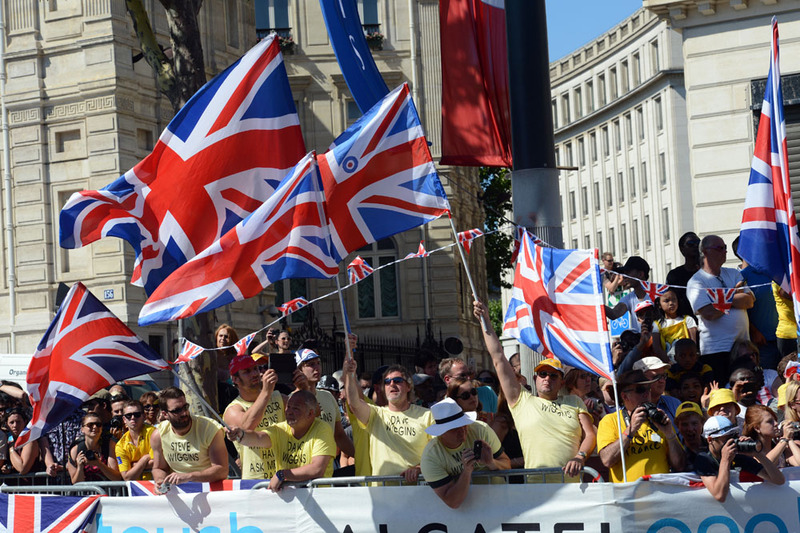 A chunk of Britain was transported to the iconic Champs Élysées, as Union-flag-waving fans turned out in force to celebrate what must rank as the country’s greatest cycling triumph. And they were there to celebrate Britain’s most accomplished all-round cyclist, who adds the yellow jersey to six Olympic medals, three of them gold. Wiggins’ Sky team-mate and fellow Brit Chris Froome finished in second place crowning what has been a dominant display by Team Sky over the past three weeks in France. Italian Vincenzo Nibali (Liquigas-Cannondale) finished third overall, six minutes and 19 seconds behind Wiggins. By his own admission, he was unable to compete with the Sky duo. Defending champion Cadel Evans (BMC Racing) also suffered during the race, but hung on to a respectable seventh place overall. Wiggins’ Tour campaign has been faultless. After placing second behind Fabian Cancellara (RadioShack) in the opening prologue in Liege, Wiggins kept himself out of trouble in a crash-festooned first week. He then took charge of the overall classification after stage seven to La Planche des Belles Filles, and then took his first Tour stage win in the time trial two days later. Wiggins’ grip on the yellow jersey tightened in the Alps and Pyrenees, where the combined effort of Froome and Wiggins dispensed their rivals with an air of cool calm. Any doubt of which of the two talented Britons should be leading Sky was dispelled on Saturday, when Wiggins obliterated the field in the final time trial, winning by well over a minute over Froome, who himself had put in a stellar ride to place well ahead of Luis Leon Sanchez (Rabobank). The day started in Rambouillet with the traditional final day procession featuring photo opportunities for the press and a tangible sense of relief from the remaining 153 riders in the race that they’d made it to Paris. 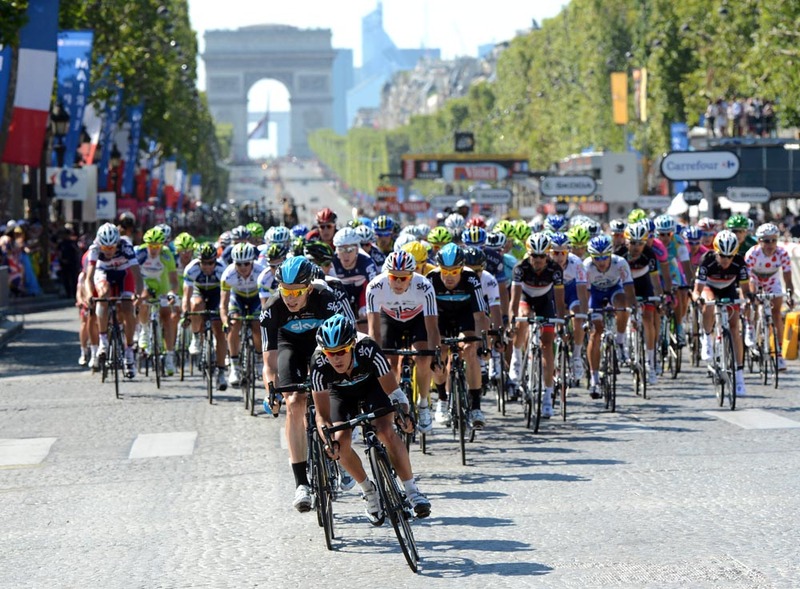 As soon as the riders hit the cobbles of the Champs Élysées the pace upped. With a flurry of attacks led by Jens Voigt (RadioShack-Nissan). The German was eventually joined by ten other riders and they quickly opened up a gap of 30 seconds and sustained the advantage until the final 10 kilometres when only Voigt, Rui Costa (Movistar) and Sebastien Minard (Ag2r) remained. Behind, a combination of Sky and Liquigas-Cannondale riders led the bunch to try and bring it all back together for a bunch sprint for Mark Cavendish and Peter Sagan respectively. The escape were caught in the final few kilometres as Wiggins hit the front of the bunch to enormous cheers from the crowd. Wiggins blistering pace set up the Sky train to deliver Cavendish to his third stage win of the 2012 race, and his fourth consecutive victory on the Tour’s final stage. It was a very fitting end to a very British Tour, where the Brits won seven stages – a third of the total. Green jersey sensation Peter Sagan (Liquigas-Cannondale) finished in second place, with Australian Matt Goss (Orica-GreenEdge) in third. As well as this being Britain’s first Tour win in the race’s 99 editions, there are a number of other records set this year. Wiggins’ win aside, Froome’s second place is the first time that a Briton has stood on the second step of the podium at the Tour. It’s the first time that four different British riders – Wiggins, Froome, Cavendish and Millar – have won stages in the same edition of the race. Wiggins sets a new British record for the most amount of days spent in the yellow jersey – 13. 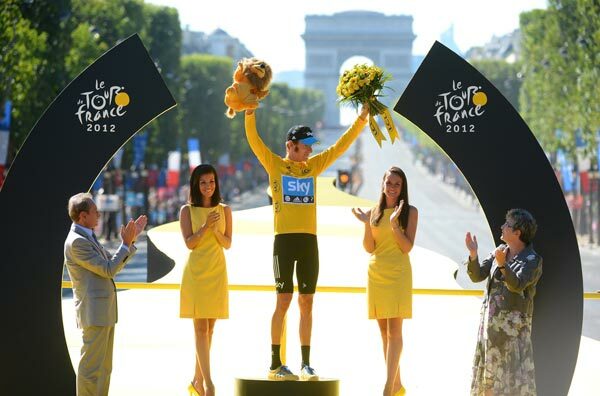 Incidentally, Britain becomes the 13th nation to provide a Tour de France winner. Wiggins is also the first Olympic gold medallist to win the Tour overall. And now he goes into the London 2012 Games as outright favourite to win gold in the time trial event. On stage 18, Cavendish equalled sprinter Andre Darrigade’s stage win record set between 1953 and 1964 for a sprinter when he claimed his 22nd stage victory. 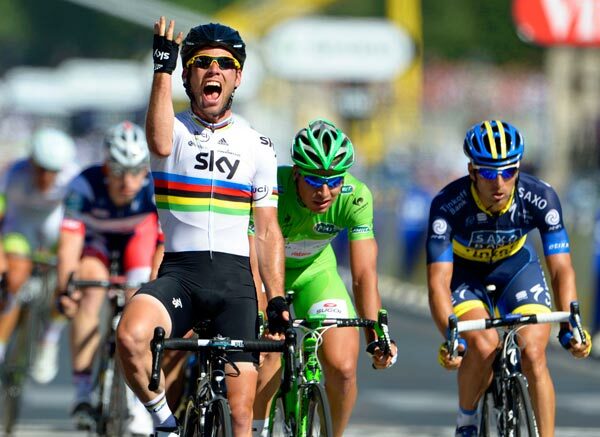 Cavendish’s 23rd stage win in Paris means he is now the Tour’s most successful sprinter of all time. The outright record for most stage wins is held by Eddy Merckx, with 34 victories. It was also a full set of firsts for the other classifications: Peter Sagan (Liquigas-Cannondale) took three stages and earned the green jersey in his debut Tour. Thomas Voeckler (Europcar) gave the home nation plenty to cheer about once again with two stage wins and the King of the Mountains title. American Tejay Van Garderen (BMC Racing) marked himself out as a future Grand Tour contender with solid rides in the mountains and time trials to win the youth classification. RadioShack-Nissan won the team classification, some consolation for what has been a torrid Tour for the team that hit a low with the departure of Frank Schleck after he tested positive for a banned diuretic during the race. As well as a Tour of firsts, it’s a Tour of lasts – for George Hincapie (BMC Racing), Alexandre Vinokourov (Astana) and Jens Voigt (RadioShack-Nissan). All three veteran professionals have now completed their final Tour. In the case of Hincapie, he sets a new record of 17 participations and equalled Joop Zoetemelk’s record of 16 Tour finishes.